Hello stampers! I made little Easter treats for the school kids. I made them in pink ribbon and yellow ribbon so the boys will not give me a funny look if I made them all in pink. I filled the treats in a cello bags. That's the last of my tiny cello bags from Stampin'Up!. The eggs was from a stamp set called Easter Blossom. Cute little eggs. I used the Two Tags Bigz Die for the basket. I made a box to go in between two of the narrow tags to hold the treats. For the box I cut a piece of 4-3/4" x 4-3/4" card stock and score at 1-1/2" on all four sides. Easy! You can make them too. I remember to take my tea party creations. I invited a few of the stay-at-home moms over yesterday to have tea. Their children were invited too as I have children myself. My kids would have been bored to death if it was only us ladies. I made a little gift box with a brooch inside for each of the ladies. You can find the gift box tutorial here if you are interest in making one yourself. I made one extra box and brooch and I'm selling it in my husband's Etsy shop. You can get it there if you would like to buy it. I made a tulle with lace trim brooch that match the box. Here's the food table. I spend lesser time for this party than the Frozen party I did for my girls back in November. You can see the post here. This was the table for my tea pots that I end up not using at all. The tea pots stayed on the table we were sitting at instead. I served 3 different tea and the moms loved it. They were all Christmas flavours. I know, it is not Spring tea flavour but they didn't care. Tea is tea. I made this banner for the food table and moved it here after the party. It was kind of hard to take picture of it by the window where the food table was. I'm selling this banner on the Etsy shop also. You can see it here. I love the 3 tier rack. I got it at Value Village for a cheap price. I don't remember how much it was. I filled it with food and put some paper roses at the top tier because it is small to put anything on it. I probably could have put the little dessert I made. It will only fit 2 on there. 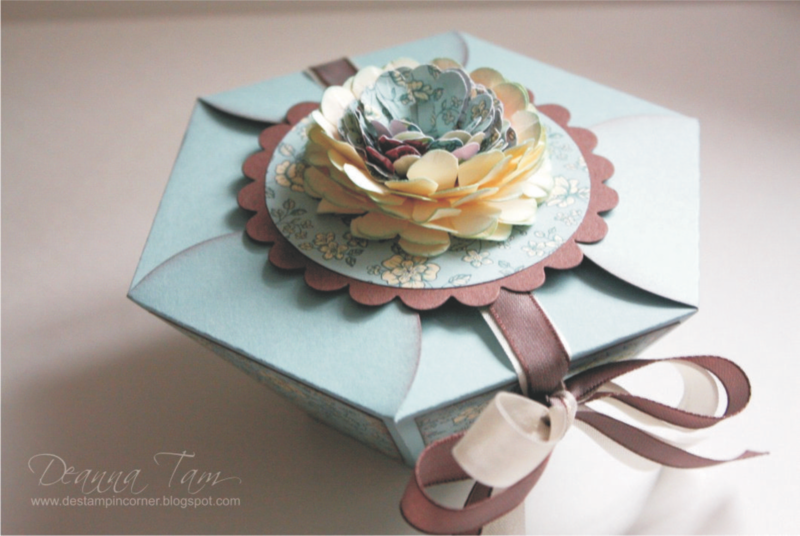 The kraft paper roses was made using the Spiral Flower Die. 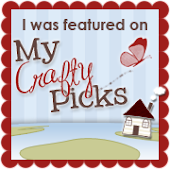 I made lots for the banner, the table, around the house and for the napkin rings. I got the tea set from my mom. It is so pretty with the roses on them. There are only 6 tea cups and saucer to this set and it is missing a sugar bowl. I used one of the tea cup for the sugar. The cute spoon is so tiny. I think it is about 1/2 teaspoon size. Never really measure it. Beautiful roses I got at a discount floral shop. The florist gave those white flowers for free. I was ecstatic to get them. I don't even know what they are called. Hello stampers! I decorated an extra jar left from the Frozen theme birthday party for my girls back in November. I made it into a Valentine one. You can put anything in there. I have some white candies with red stripes on them. Perfect colour for Valentine. I cut out a red glittery heart and mounted on a doily piece and adhere them to the jar. Made a "happy valentine's day" sentiment and adhere it to the front. I made invitations for a teenage girl who will be turning 18 next month. 18 is a special age to Filipinos just like sweet 16 is special to the western culture. They have a big party to celebrate this special occasion. Almost as big as a wedding with over 100 people. I made a box to hold the invites. They looked so cute! She knew exactly what she wanted so it was easy to make. It still took me awhile to make it though. Had to take lots of rests because of my back pain. I used kraft treat bags as envelopes for the invites. Something different from the usual envelopes. I do custom birthday and wedding invitations. Contact me for details. I made these curvy keepsake boxes for the school kids this past Christmas. I finally used up all of my Stampin'Up! retired Christmas designer series papers. Now I can buy new ones.